I was just going to my dashboard and could get it why I see my card in there . 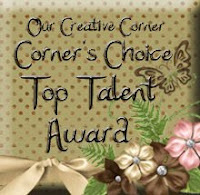 And on my own surprise I won challenge in Our Creative Corner to which I was entering for the 1´st time. Thank you girls you make my day !! !